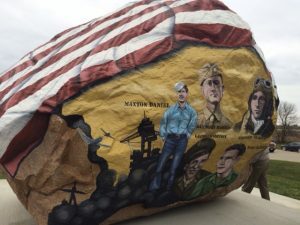 On the 11th hour of the 11th day of the 11th month nearly 500 people from around the country joined near the Clarke County Iowa town of Murray for the dedication of the Clarke County, Iowa Freedom rock painted by artist Ray “Bubba” Sorenson II. 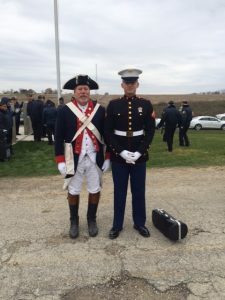 Among the attendees were color guard members of the American Legion, the Veteran of Foreign Wars and the Iowa Society of the Sons of the American Revolution. 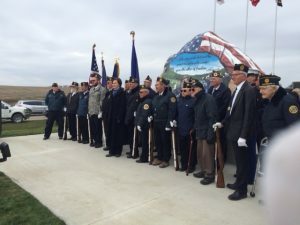 Governor Reynolds gave a passionate speech on the sacrifices of the veterans and their families to preserve and protect the liberties of all. 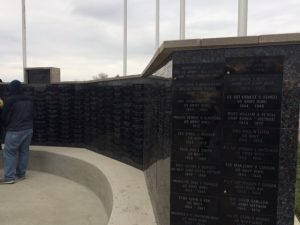 It was also noted that current members of the military account for only about 1% of the population. 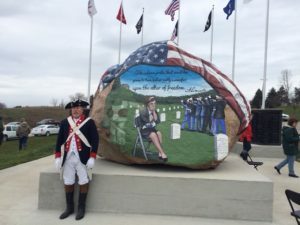 Mr. Sorenson shared with those in attendance his vision for this Freedom Rock in particular as well as the individualization of all 68 Freedom Rocks done to date in Iowa. Attached are several photos from the event today. 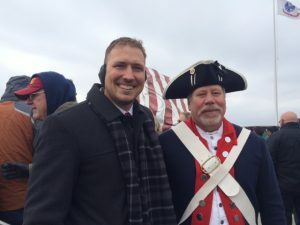 Be sure to send any local events you may have been a part of to our Iowa SAR webmaster Patrick Lant and our Iowa SAR newsletter editor Doug Frazer.